Niseko is one of the most popular and celebrated ski resort areas of Japan. Located to the west of Sapporo city on the slopes of Mt Niseko Annupuri with stunning views of nearby Mt Yotei, it's often superb dry powder snow conditions are popular with skiers and snowboarders from around the world. Niseko certainly has a different feel from many other Japanese ski resorts, if not only because of the higher percentage of visitors from around the world and subsequent catering to their needs. There's a good choice of places to eat and a bustling nightlife to enjoy as well in the main areas. Niseko is the name of a town. Kutchan is the name of a town. Niseko Station is the name of a small train station on the local line. Kutchan Station on the Hakodate Honsen is the main and most convenient station used by people travelling to the Niseko area for the ski and snowboard resorts. Many people actually prefer to use direct bus services to Niseko from Sapporo and New Chitose Airport - see bus information below. Train services operate between Sapporo Station and Kutchan Station, with many requiring a transfer at Otaru Station on the way. This journey is around 93km. With good connections this can be done in as little as around 100 minutes - but sometimes waiting for connections at Otaru can be fairly lengthy and greatly increase that time. During the winter season, there is a limited express 'Niseko Ski Express' service a few times a day which goes directly from Sapporo Station to Kutchan Station using the Hakodate Honsen lines. This service takes around two hours. The Niseko Ski Express train stops at Niseko Station, Kutchan Station, Otaru Station, Otaru Chikko Station, Teine Station and Sapporo Station. This journey is around 140km and usually takes around 2.5-3 hours. This journey is around 193km and usually takes around 3 hours. During the main winter months - usually from December until March - a number of private bus companies offer direct services to Niseko from Sapporo City and also from New Chitose Airport. These regular and convenient services are probably the most popular way to get to Niseko. The bus services from Sapporo City have various pick-up points around the city including the main Sapporo Station. These buses go direct to Niseko and stop at the three main ski and snowboard resorts (Niseko Grand Hirafu, Niseko Village and Niseko Annupuri). The journey from Sapporo to Niseko usually takes around 3-4 hours depending on your start point and costs about 3,500 yen. Similarly, various bus companies also offer direct services to Niseko from New Chitose Airport. 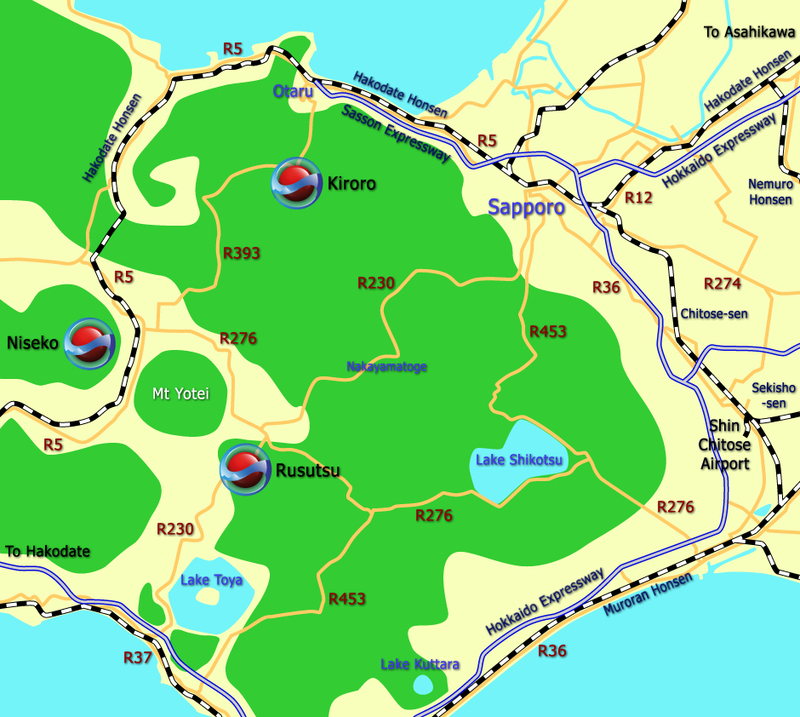 The route taken by these buses is via Lake Shikotsu and also close by the Rusutsu resort, and offering drop-offs there. The journey from Shin Chitose Airport to Niseko takes around 3 hours and costs about 3,500 yen. There are a number of buses scheduled between Rusutsu and Niseko each day during the winter season. This journey usually takes around 40 minutes and costs around 1,000 yen. Hotels and other accommodations in Niseko will be able to provide more information on these services and perhaps recommend the best options. There is also a Hanazono Shuttle that goes from the Hirafu Welcome Center to the Hanazono resort area. There is no train line from the Niseko area in the direction of Rusutsu - use bus services to get to Rusutsu. There is no train line from the Niseko area in the direction of Kiroro - use bus services. 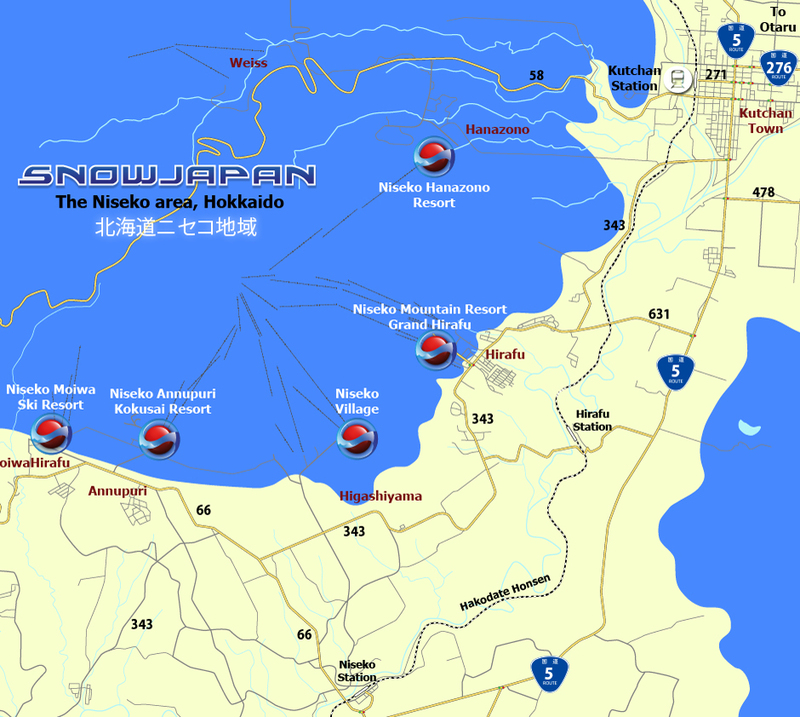 For detailed information on how to get to Niseko by car, please go to this section.